The recent near-war in Latin America indicates the deep and emotional ties between a narco-terror army and several neo-Marxist Latin American governments. The killing of a top guerrilla leader during Columbia’s small cross border raid into Ecuador nearly led Latin America into a general war. Colombia's government claimed Venezuela and Ecuador have secretly supported Colombian rebels. As this alliance between guerrilla and governments grow, at stake for the United States is its security and survival. The narco-terror army is the FARC (the Spanish abbreviation for Revolutionary Armed Forces of Colombia), which is instrumental in bringing tons of cocaine to American streets and guerrilla training to America's enemies. The money paid by U.S. citizens to drug dealers is helping the FARC not only to purchase small arms for itself and instruct other would-be terrorists, but also to assist in its search for nuclear material to manufacture a "dirty bomb" that could be intended for a U.S. city. The FARC, a Marxist rebel group, has been at war with the Colombian government for some 40 years. The war is waged both in the jungle and in the nation's cities. The struggle has cost the lives of tens of thousands of people. Computer files captured by Colombian army units following a raid one mile inside the territory of neighboring Ecuador have documented a close cooperation between the FARC and the government of oil-rich and neo-Marxist Venezuela. The same documents also revealed that the FARC contributed funds to the successful 2006 election campaign of Rafael Correa, president of Ecuador, who recently declared his nation "socialist." Correa took office in January 2007. 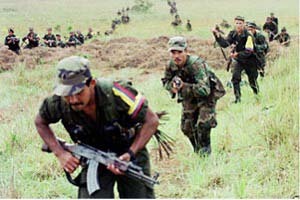 The raid also demonstrated the international reach of the FARC. Guerrillas-in-training from several nations were killed in the raid, including would-be revolutionaries from Chile and Mexico. The presence of slain Mexican citizens at the raided FARC camp is particularly ominous, because Mexico is already a hotbed of Communist activity, both in legitimate politics and small Marxist rebel groups. Mexican authorities are investigating a possible link between the FARC and Communist Cuba's espionage services. There is evidence that an individual known as Mario Dagoberto Diaz Orgaz led a number of Mexicans to the FARC camp in Ecuador. Diaz Orgaz, who had arrived in Mexico from Cuba in 2000, obtained Mexican citizenship in 2003, and is known to have carried an average monthly bank balance of $80,000. Trained in mechanical engineering in Russia, Diaz Orgaz was able to obtain an academic post in Mexico. According to the Spanish language La Nueva Cuba, Diaz Orgaz worked at Mexico's National Council for Science and Technology. His position there, however, could not have supported his substantial bank account. Although the media rarely informs the American people of Marxist activity in Mexico, several communist guerrilla groups are active just south of the U.S. border. Mexican oil pipelines have already been attacked, as have lesser targets, and it is now a certainty that the FARC is active in the training of Mexican guerrilla-terrorists just south of America's still porous borders. Mexican guerrillas may not have to fight for long. The former mayor of Mexico City, Lopez Obrador, was very nearly elected president. Obrador, who remains a powerful leftist candidate, is an ally of Venezuela's neo-Marxist leader, Hugo Chavez. American citizens are directly affected by FARC actions in the region. The United States is assisting the Colombian government in its fight against FARC narcotic and revolutionary activities. U.S. financial aid and military advisors are attempting to assist Colombia in its fight against the FARC's well-financed guerrilla operations. Three Americans are being held by the FARC, military contractors whose plane crashed in the Colombian jungle in February 2003 during a surveillance flight over a FARC-controlled area. Little media attention has been given to the three American captives who have been prisoners for five years and are known to have been tortured by their communist captors. The names of the imprisoned Americans are Thomas Howes, Keith Stansell, and Marc Gonzalves. 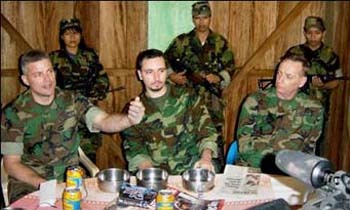 In January 2008 the FARC vowed to keep the three captured Americans for 60 years, the same length of time given as a sentence by an American court to a FARC senior officer known as "Simon Trinidad" after his conviction for his part in the capture of the Americans. FARC has close ties to Chavez and his regime which are based upon political affinity, mutual hatred for the United States, and financial cooperation. The FARC shares Chavez's "Bolivarian" ideology which combines Marx with Latin American aspirations for a higher degree of mutual political assistance. 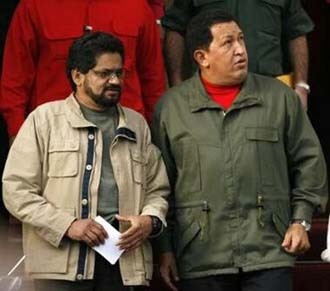 Both Chavez and the FARC see the United States as "the empire," and wish to destroy this identified enemy. Cocaine production in Colombia is protected by FARC armed groups, and Colombian narcotic shipments into the United States and Europe are often directed through Venezuelan territory with the cooperation of high "Bolivarian" authorities. The "Bolivarian Republic of Venezuela" is the leading oil-rich Marxist state, one of the world's largest oil producers, and one of the main U.S. suppliers of oil. Gasoline from Venezuelan oil purchased by U.S. citizens, oftentimes through Venezuela's wholly owned U.S. subsidiary CITGO, has enabled Hugo Chavez to purchase sophisticated planes, ships, and aircraft, much of it from Russia. Ecuador and Bolivia are active in exploiting their own resources, especially natural gas. The security threat from the FARC and its governmental allies is serious and immediate. During the Cold War, Communist revolutionaries had little money and were forced to depend upon subsidies from an often cash-strapped Soviet Union. Today Latin American neo-Marxists are awash in money. The FARC obtains millions of dollars from narcotic sales, and supplements those funds with the proceeds from kidnapping and extortion. Venezuela is a world oil supplier, while Chavez allies Ecuador and Bolivia are attempting to exploit reserves of natural gas. FARC and its state supporters, especially the Chavez regime, can afford to carry on a prolonged offensive against the United States with the object of isolating and then undermining the U.S. government. The aggression is real, so also must be the U.S. response. "The Closest Thing Possible to Stalinism"